• Tomorrow night is Riverhead’s National Night Out Against Crime, where neighborhood watch groups throughout town will be holding block parties and the Riverhead Police Department and McGruff the Crime Dog will be making the rounds visiting watchful neighbors and giving away freebies. The police department is asking neighborhoods to hold front porch vigils, keeping their lights on between 7 and 10 p.m. and joining with their neighbors in cookouts and walks around the neighborhood, which should scare away scary people. 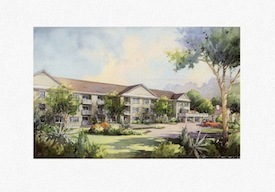 An artist’s rendition of Peconic Landing’s planned expansion. • Peconic Landing, the continuing care retirement community in Greenport, announced yesterday they’ve received New York State approval to move forward with an expansion – the largest expansion of their facilities, amenities and therapies in their 12-year history.The expansion will include 16 new private skilled nursing and a 16-suite memory support assisted living wing for those with cognitive impairment, both which will be designed in a neighborhood model, with a common area with a kitchen, dining area, great room and activity area. Peconic Landing also plans to add 46 residential apartments ranging in size from 750 to 1,100 square feet, expanded fitness facilities and a technologically enhanced “smart” classroom. The project is currently in the final stages of review by the Southold Town Planning Board. • Southampton is looking to block access to the crumbling fishing platform of the old Ponquogue Bridge, which was severely damaged in Hurricane Sandy, while a plan to replace the platform awaits word on funding from FEMA. The Beacon’s full story is online here. • Second Quarter real estate reports are out, and they’re somewhat mixed. Prices and number of sales on the North Fork are on the rise, while prices of houses sold on the South Fork declined slightly. This decline is believed to be due to more activity in the low-end market. The Beacon’s full story is online here. • The Tick-Borne Disease Resource Center of Southampton Hospital will host a presentation on these nasty diseases by Anthony Knott, MD at the Montauk Library tonight at 6 p.m. More information is online here. • A portion of Peconic Bay Boulevard west of South Jamesport will be closed today while crews work on repairs to the bridge over Brush’s Creek. • Riverhead’s No Doubt World Famous Monday Night Band holds its final concert of the summer tonight on the front lawn of Pulaski Street School. The concert, which starts at 7:30 p.m., will feature music from “South Pacific.” If you haven’t seen them yet, why not? It’s free and they’re world famous. More information is online here. ← Riverhead Gets Ready for JumpstART!